J – Hello all! 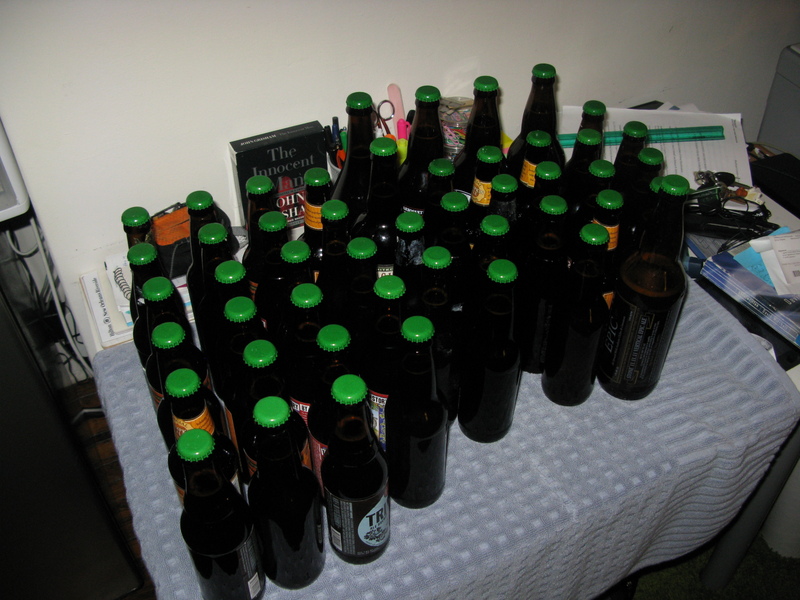 Today was busy: I bottled an Oktoberfest (German Amber Lager) that I brewed mid-September and brewed a pumpkin ale that should be ready in 3-4 weeks – maybe in time for Thanksgiving! First, the bottling. Bottling is easy but tedious. Step 1: Clean and prepare some empty pop-top bottles. Step 2: Transfer the fermented beer from the glass carboy where it has been for a month and a half to a bucket to make it easier to dispense into the bottles. 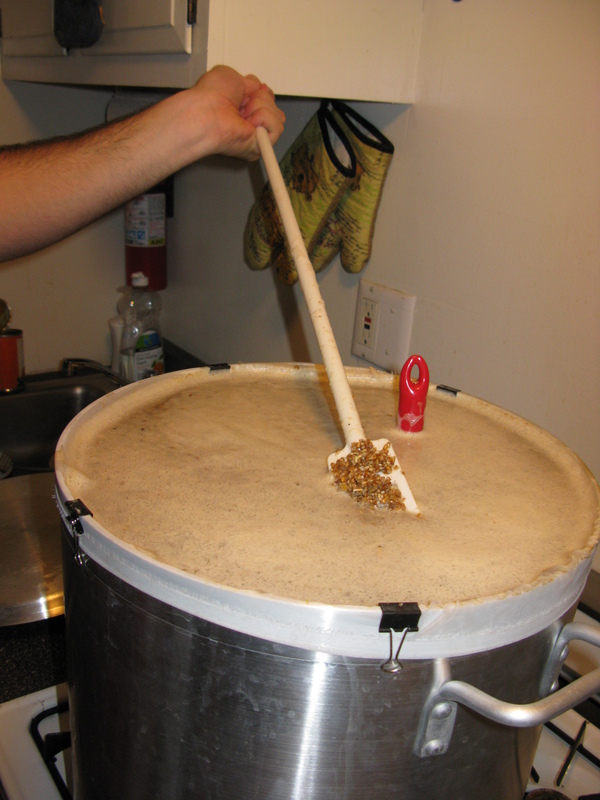 I also add sugar (about 3.3 oz) to the beer so that the yeast has something else to eat in order to produce CO2. Right now, the beer you see here tastes like beer but it is totally uncarbonated, so it’s flat. In the sealed bottles, the yeast will eat the new sugar I put in and produce CO2, carbonating the beer. This takes from 3 days to a week, depending on the amount of carbonation you want. Step 3: Fill up all the bottles and cap them. Easy enough but takes forever. Here is the finished product! 5 gallons of beer, all ready to go. You can see I reuse some beer bottles from other commercial breweries – normally, I remove the labels, but tonight I was lazy. 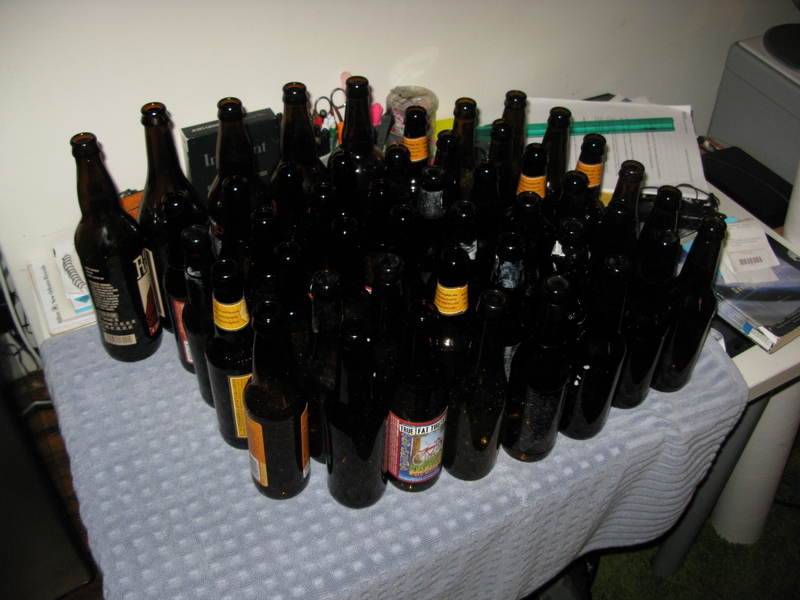 Ok, so that’s the bottling. It looks (and really is) easy, it just takes a long time. While I was bottling I was also brewing a pumpkin ale that I’m really excited for. For anyone that does not know how this process goes, it’s actually quite simple: basically, you make tea with grains. 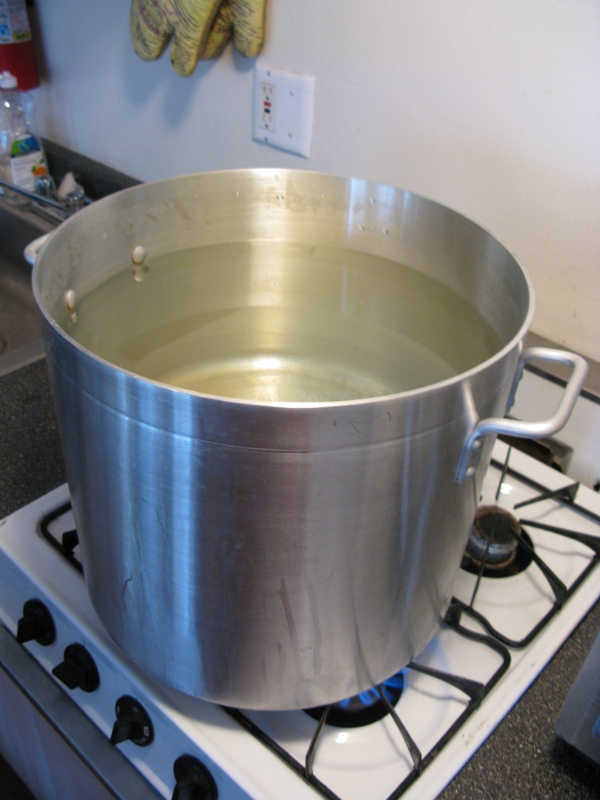 You heat up a lot of water and steep a lot of grain in there for about an hour. This process is called mashing and it removes the sugars from the grains. Cracked grain has enzymes in it that will process the starch contained in the grain into sugars if the ambient temperature is about right – ~150 F or so. 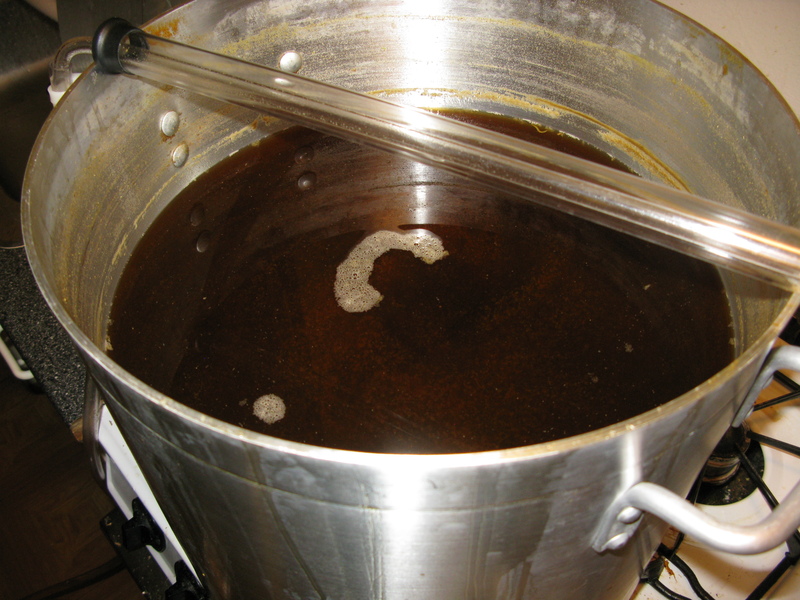 After you make this grain “tea,” called wort, you drain the rest of the liquid from the grain bag and boil what is in the pot (about 6 gallons of wort). When the wort is boiling, you add hops and, in this case, spices. Hops make beer bitter and also add a lot of fragrance to it, which is important because unhopped beer would be sickeningly sweet. There are a TON of different types of hops, and they each add their own unique flavor profile. After the boil, the next step is to rapidly cool the wort down from boiling temperature to about 75 F. The purpose of this is to cool down the beer enough that you can add yeast without killing the poor little guys. After the wort is cooled, you transfer it into a carboy, or a big glass tank that will house the beer while it ferments, and add the yeast, called pitching. Once the yeast has been pitched, it sits for a few weeks while the yeast convert the sugar in the beer into alcohol. First, here are all of my ingredients, including almost 17 pounds of grain, a few ounces of hops and spices, and a liter of yeast that I prepared yesterday – this is just a container full of sugar water that I use to start the yeast growing and multiplying before adding them to the beer. 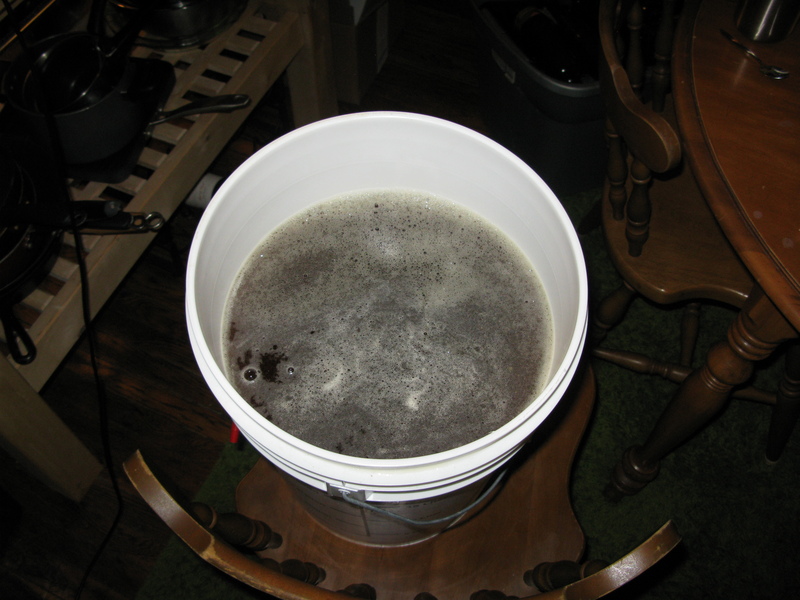 If you don’t make one of these – called a starter – then the yeast multiply too fast and become stressed, creating undesirable flavors in the finished beer. Cool to 70, pitch 1L starter. 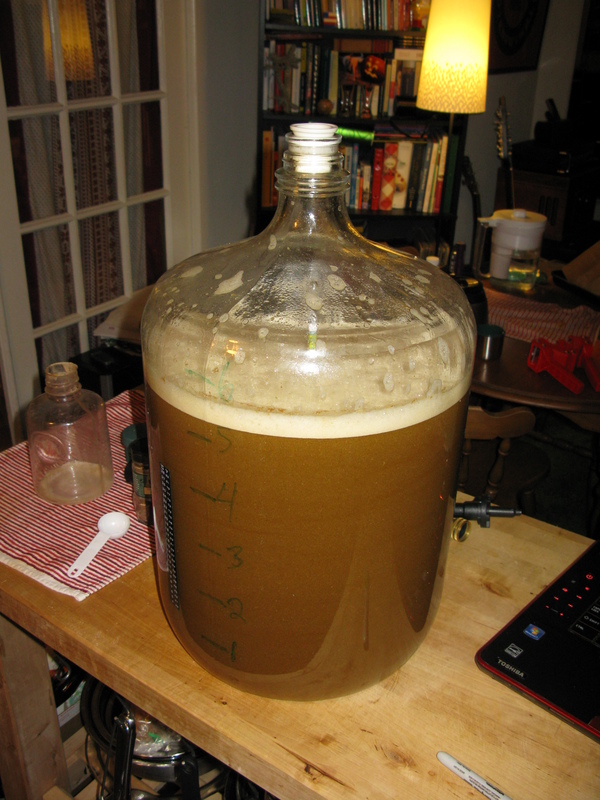 I used Kolsch II yeast because I had it sitting around and I trusted my Kolsch colony more than my Safale US-05 colony. Really, this should go with a cleaner fermenting yeast like US-05, but I like Kolsch II, even at ale temps. I’ll let you know how it turns out. 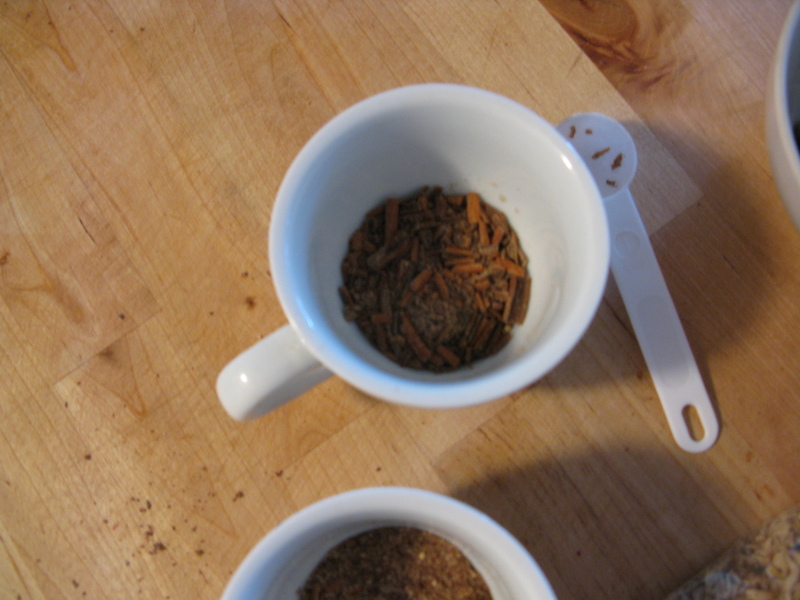 Add a couple of vanilla beans soaked in vodka and other spices to taste to secondary, ferment for 2-3 weeks. My OG was 1.062, but I was WAY off. I aimed for 1.083. 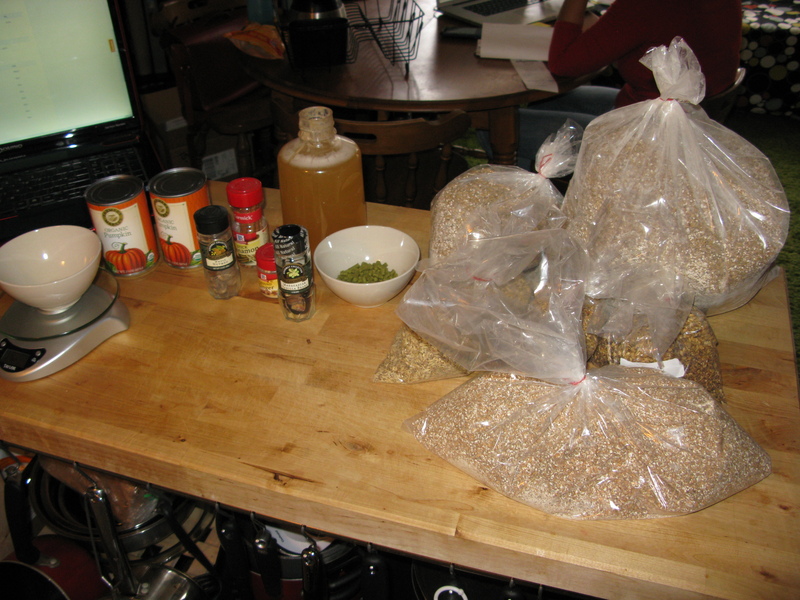 As you can see, I’m doing brew-in-a-bag and this grain bill was just too much for my setup. I should have mashed for 90 or even 120 minutes, but I knew it was already gonna be a long day and got lazy. My mistake. Step 1: Start heating up the mash water. That’s about 9 gallons of mash water there. Step 2: Once the water is about ~155 F, add the grains. This is almost 17 pounds of grains, plus 30 oz of canned pumpkin. Step 3: After an hour, I removed the grains and drained the bag. Time to start the boil! 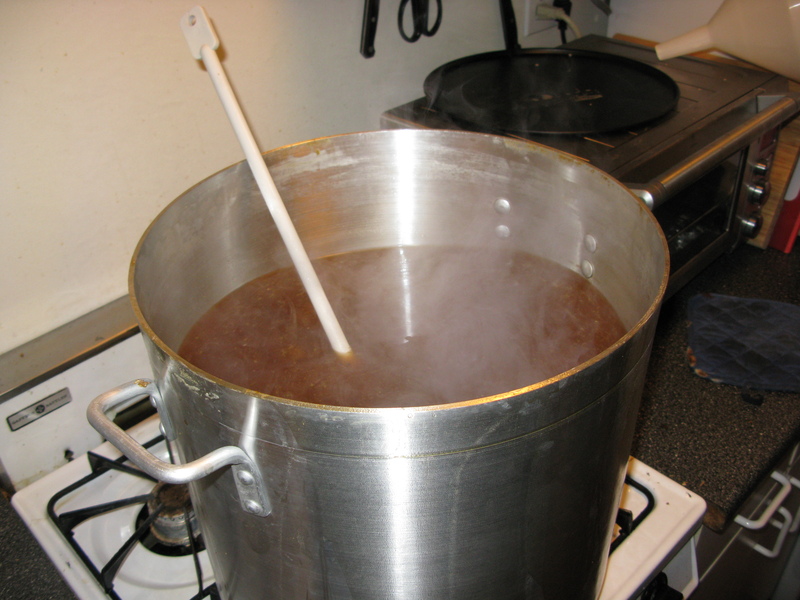 The liquid in the pot is now called wort (pronounced wert). 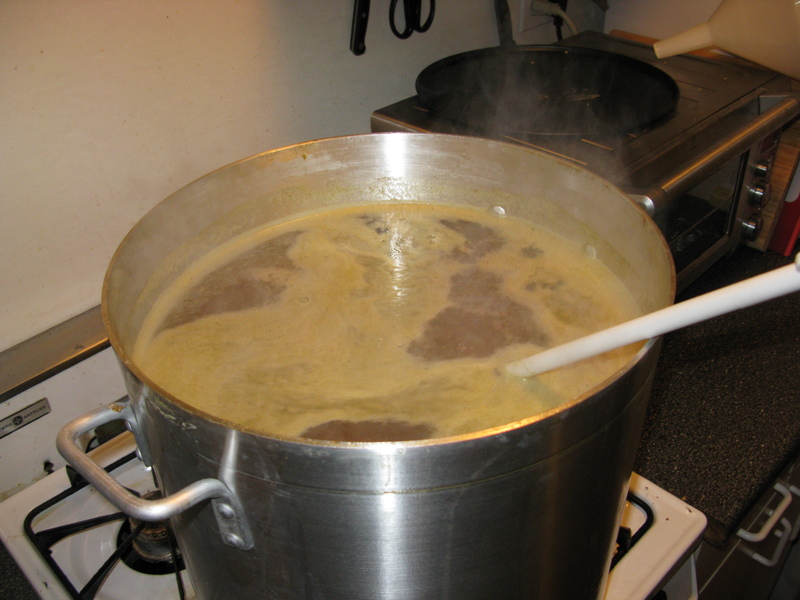 And this is the boiling wort just after I added the spices and hops. It smells just like pumpkin pie. Step 5: Once the wort has boiled for an hour, it’s time to cool it down. Here it is just after it cooled to ~70F. Step 6: Transfer the wort to a fermenter and pitch the yeast! And there you go! I’ll post some video or pictures of it fermenting tomorrow. The fermentation is VIGOROUS and, I think, totally cool. The yeast have the time of their life and you can see yeast colonies floating around in the beer as they consume all the sugar they can. In the meantime, it’s time to clean up my mess before Ines notices how dirty I made our kitchen!